A voyeuristic installation showing two of the artists in bed together. On the gallery wall is a video projection showing a fixed view of a flat. In shot is a video camera. 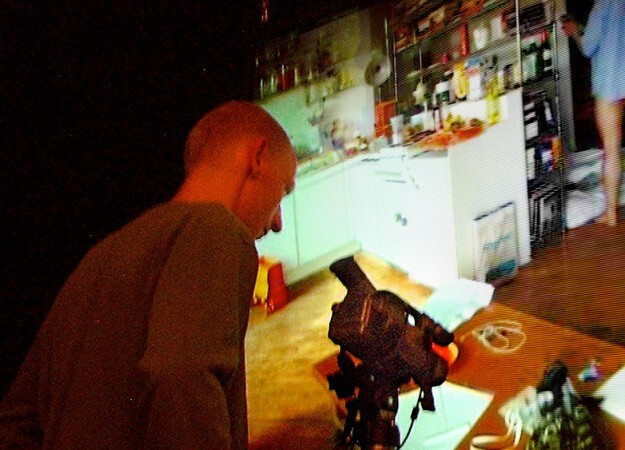 In front of the video projection stands the actual camera and tripod. On the video projection one can see shelves, books and - partially obscured - two people on a bed. By approaching the video camera and looking through the viewfinder the visitor can see a close up view of the activity on the bed. Filmed continuously over 24 hours using a time lapse technique Viewfinder juxtaposes the everyday with the pornographic. Referencing web cams and reality television, the piece poses questions about mediation, self reflexivity and the voyeuristic impulse. Viewfinder premiered at the LISTE01 Young Art Fair, in Basel, Switzerland where Blast Theory were invited as special guests. Thanks to plug-in for inviting and organising the showing and the support of the British Council.